Kodak EasyShare DX3500 Digital Camera Software Driver and Firmware for Operating Systems. 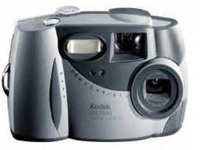 This firmware version provides: fix for the SANDISK COMPACTFLASH (CF) Card compatibility problem; improved Auto White Balance in low lighting situations; improved Date/Time stamp feature; formatted CF card Volume name set to “Kodak”; more Internal Memory. , and filed under Digital Camera and tagged dx3500, dx3500 download, easyshare dx3500, kodak dx3500 camera, kodak dx3500 driver, kodak dx3500 software.